Grayson Sallade, right, of Manheim Township celebrate scores against Michael Clibanof of La Salle to give Manheim Township a 6-4 lead in the 4th quarter against in the PIAA Class 3A State Boys' Lacrosse Championship game at West Chester East High School on June 9, 2018. Accepting a silver medal after doing it might be even more difficult. 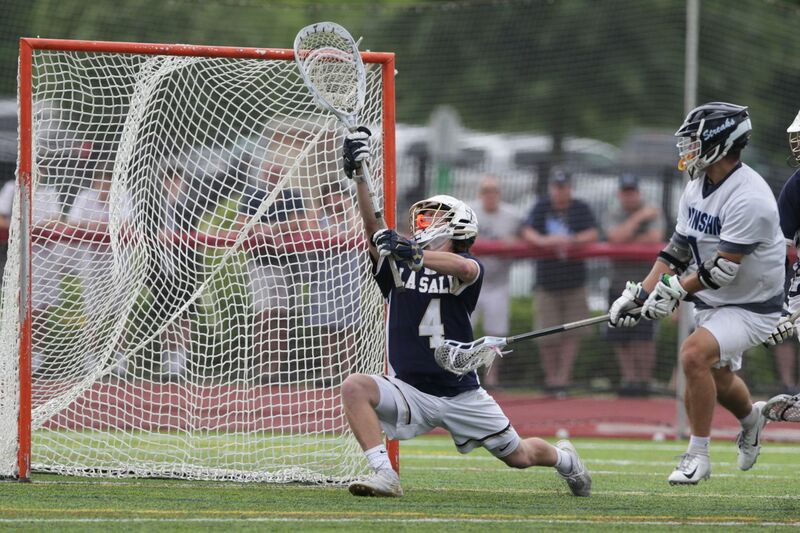 La Salle lost, 6-4, Saturday afternoon to Manheim Township in the PIAA boys' lacrosse 3A championship game at West Chester East. Manheim, of District 3, became the first boys' school to win a lacrosse crown outside Districts 1 or 12 since the tournament began in 2009. The Explorers didn't keep their medals around their necks for long. The rejection did not seem like an act of disrespect. The scene was more like a visual representation of heartache on display for all to see. When the Blue Streaks (23-1) received their gold medals, each Explorer stayed in line on the track. A few even politely applauded as the golds were given. Some of those Explorers experienced heartbreak for the second time after enduring a championship loss to Springfield Delco in 2016, also at West Chester East. "I thought they played better in almost every fashion," said La Salle coach Billy Leahy. "Credit to Manheim Township. We didn't play a great game. I'm not sure who that was exactly today, but they were good, so congratulations to Manheim." The Blue Streaks' goalie and University of North Carolina recruit, senior Caton Johnson, was stellar, stopping 11 shots, including five in the third quarter and four in the fourth. La Salle (19-5) was led by senior Brendan Meagher, who finished with two goals, including the game's first with 9 minutes, 41 seconds left in the first quarter. Manheim, however, knotted the game at one late in the first. The teams entered intermission tied at two. With the game in the balance, La Salle, which trailed, 4-3, entering the fourth quarter, fell behind, 5-3, with 8:30 left. An Ethan LaMond goal got the Explorers within a goal at the 3:40 mark. And, on the Blue Streaks' ensuing possession, La Salle forced the ground ball it needed. The scrum that followed, however, batted the ball around and eventually onto the stick of Manheim's Grayson Sallade, a senior bound for the University of Virginia. A dip and dodge later, Sallade backhanded a shot past La Salle goaltender Michael Clibanoff with 2:45 left. "This is something that no one can ever take away from us," Sallade said. "It's an unbelievable feeling that will last a long time. On being the first team outside Districts 1 or 12 to win the title, Sallade said: "It means a lot. Anyone can win on any given day. High school sports comes down to grit, want-to and preparation." MH: Grayson Sallade 2, Eddie Newman 2, Zach Diamond, Bryce Hutchinson. LS: Brendan Meagher 2, Matt Clibanoff, Ethan LaMond.